Sheriff's Maj. Jimmy Stanford said deputies have arrested about 10 looters each night since Florida's Bay County took a direct hit from the strong Category 4 storm last Wednesday. In some parts of the county, residents have spray-painted signs warning that "looters will be shot." Callaway resident Victoria Smith told the News Herald that thieves came into her townhome while she and her four children were sleeping with the front door open to allow a breeze inside. "I must've been so exhausted from everything in the past days I didn't even hear them come in," Smith said. "They just snatched my purse out of my hands and ran. ... It was all we had." "Most of our officers lost their homes, have been working 16- to 18-hour shifts with no sleep, no shower, and now they're encountering armed individuals," he said. "It's a stressful time for everyone in Bay County." The storm killed at least 16 people in Florida, most of them in the coastal county that took a direct hit from the storm, state emergency authorities said Tuesday. That's in addition to at least 10 deaths elsewhere across the South. 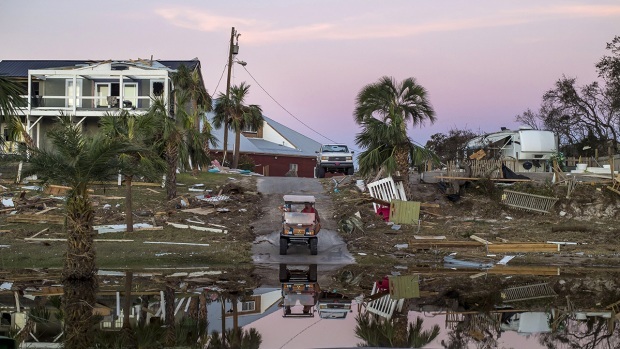 The scope of the storm's fury became clearer after nearly a week of missing-persons reports and desperate searches of the Florida Panhandle neighborhoods devastated by the most powerful hurricane to hit the continental U.S. in nearly 50 years. The Florida Department of Emergency Management's count of 16 dead was twice the number previously tallied by The Associated Press, and included 12 deaths in Bay County, where the hurricane slammed ashore with 155 mph winds and a catastrophic storm surge last Wednesday. Only one person remained missing in Mexico Beach, Cathey said, adding that authorities were almost certain that that person evacuated before Michael and simply hasn't been contacted. "We're holding steady at two and don't expect that number to rise," the mayor said. Cathey had a one-word exclamation when his Verizon phone started working for the first time in nearly a week: "Hallelujah!" Verizon service also resumed in Panama City, where residents haven't been able to contact loved ones or call for help. The telecommunications giant later announced it would give a three-month credit to every Verizon customer in Bay and Gulf counties. "A lot of people didn't even know we had evacuated and come back," said Tanksley, whose phone uses the Verizon network. "I turned my phone on this morning and it started going crazy," she said. "There were all kinds of messages, Facebook notifications, emails and emergency alerts."